Everyone involved in the geophysical industry is accountable to themselves, their families, their fellow workers, their employers and their clients to work in a safe and responsible manner, follow established rules, comply with local regulatory requirements and follow their company's policy. All personnel should challenge and report all unacceptable HSE situations, incidents, (accidents and near misses), whenever or wherever they occur, to their supervisor. Always Remember: Common Sense Is Not So Common. Do not expect others working with and around you to always see potential hazards the same way. All geophysical personnel should work together and communicate their experiences and knowledge to ensure there is a shared perception of the risks. The quality of the geophysical industry's work is dependent on our skilled and experienced personnel. Accidents deplete this invaluable resource. The IAGC hopes that the use of this manual will lead to greater HSE awareness throughout the industry and improve performance for all operators. 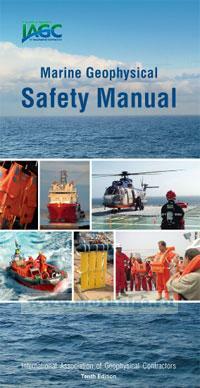 The IAGC encourages all employees to read this manual and to become familiar with its content.